We sell a wide range of quality used machinery all over the world and we’re able to offer a range of services to facilitate export sales. The majority of our export sales are to Europe but we’ve been known to sell as far as New Zealand so there’s no real geographical limit. PLEASE NOTE: FOR EXPORT ALL GOODS TO BE PAID AND FUNDS CLEARED BEFORE LOADING/DELIVERY. PLEASE DO NOT ARRANGE COLLECTION BEFORE YOUR FUNDS HAVE CLEARED. For the vast majority of our export sales the buyer arranges collection from our depot (EXW). At each depot we are well equipped to load machinery onto trailers, into containers etc. We’re also able to deliver to shipping docks (FCA) for the buyer to take overseas – however, this is at the buyer’s cost unless otherwise agreed in the sale and is subject to our transport being available. This must always be agreed in advance of booking ferry transport. 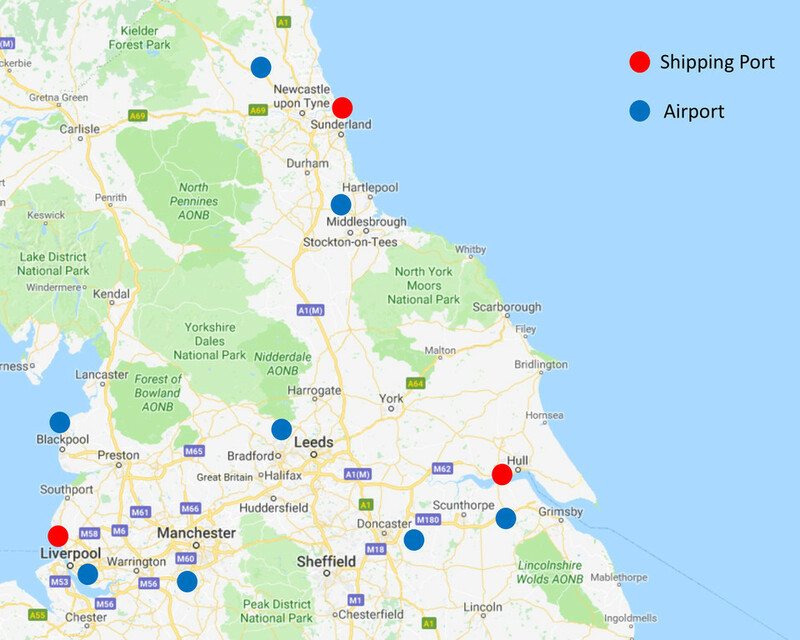 If you’d like to visit us from overseas the map below will show you the nearest airports to fly to and the nearest docks to arrange export from. Distance from Foxholes Depot: 47 Miles 1h Approx. Distance from Riccall Depot: 49 Miles 1h Approx. Distance from Foxholes Depot: 65 Miles 1 ½ Hrs Approx. Distance from Riccall Depot: 39 Miles 1h Approx. Distance from Riccall Depot: 37 Miles 1h Approx. Distance from Foxholes Depot: 67 Miles 1 ½ Hrs Approx. Distance from Riccall Depot: 58 Miles 1 ¼ Hrs Approx. Distance from Riccall Depot: 89 Miles 1 ½ Hrs Approx. Distance from Foxholes Depot: 110 Miles 2 ½ Hrs Approx. Distance from Riccall Depot: 102 Miles 2 Hrs Approx. Distance from Foxholes Depot: 145 Miles 2 ¾ Hrs Approx. Distance from Riccall Depot: 117Miles 2h Approx. Distance from Foxholes Depot: 135 Miles 2 ½ Hrs Approx. Distance from Riccall Depot: 108 Miles 2h Approx.